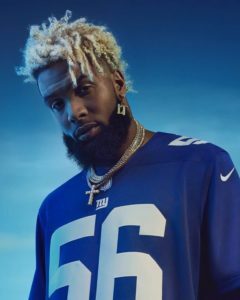 Odell Beckham Jr. is one of the most recognizable players in the NFL, partly because of his skills on the field and partly because of his distinctive hair. Throughout the course of his career, Beckham has often used his hair to express his personal style. 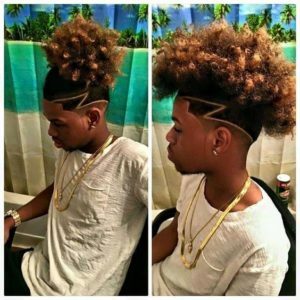 Fans have watched his style evolve over the years as he’s slowly become a natural hair icon of sorts. 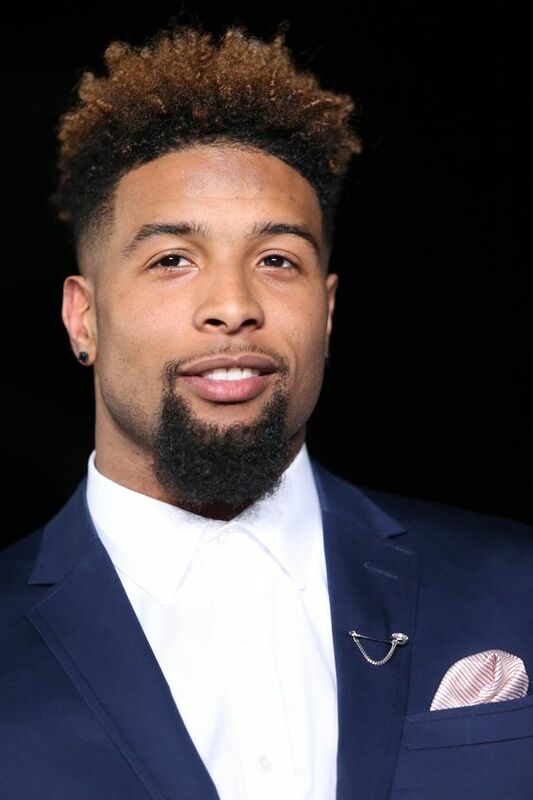 It’s hard to deny the impact Beckham’s style has had on natural hair trends for men and boys. 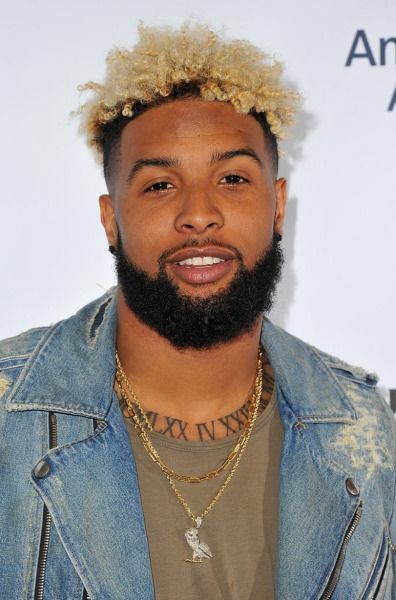 While he’s certainly not the first to wear a blonde mohawk, Beckham’s status as a football star has made it trendy to a whole new demographic. 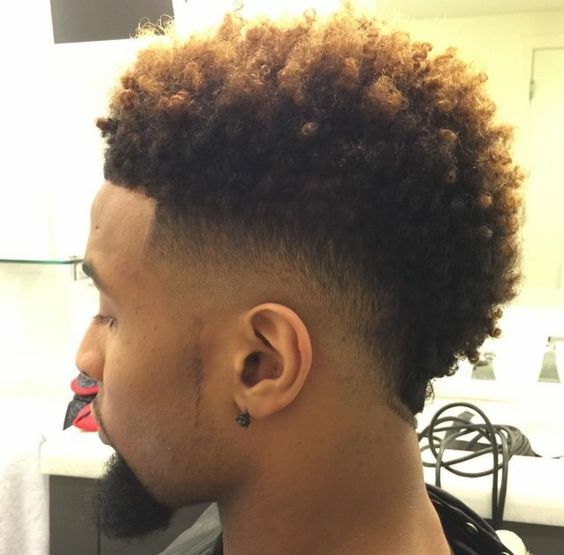 Read on all about Odell Beckham Haircut looks with images and hair styles inspiration. 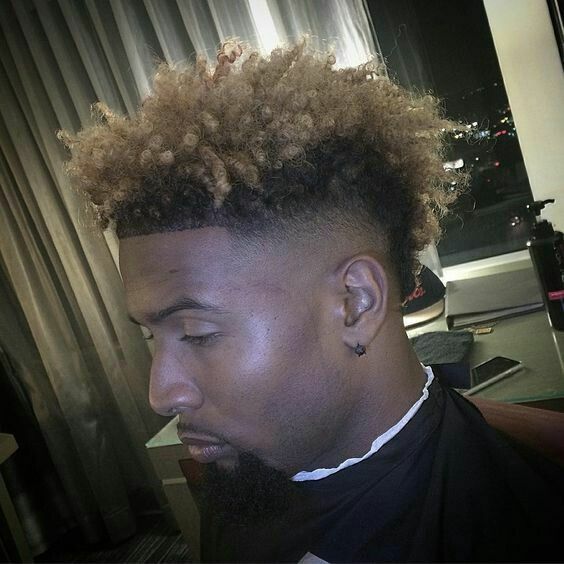 Odell Beckham Jr.’s signature style can be described as a mohawk or burst fade cut with the ends dyed blonde. 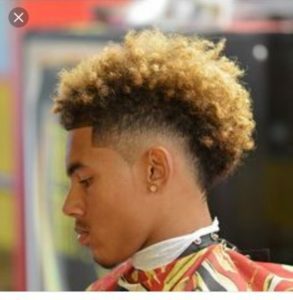 The cut is also known as the South Of France haircut. Sometimes the color varies, ranging from a sandy, dirty blonde to pale blonde. The same goes for Beckham’s curls: sometimes they are closely cropped and other times they’re styled into medium-length ringlets. 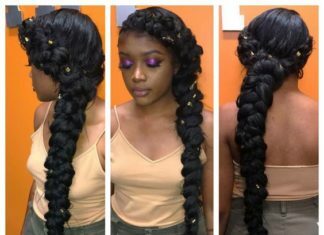 The versatility of this look makes it easy to replicate on different lengths and textures. As popular as it’s become, Beckham’s signature style was not created overnight. During his college days, his hair went from a simple close-cropped cut to a textured high top with a touch of sandy brown color. 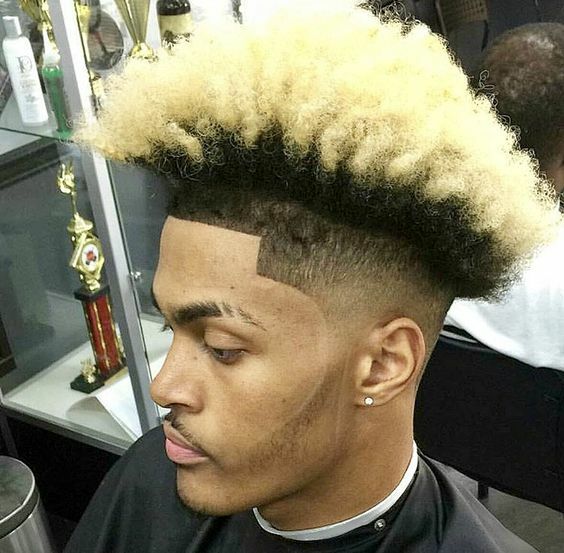 After being drafted to the NFL, he was frequently seen rocking a frohawk. His hair color gradually became lighter, sometimes alternating between red and blonde. 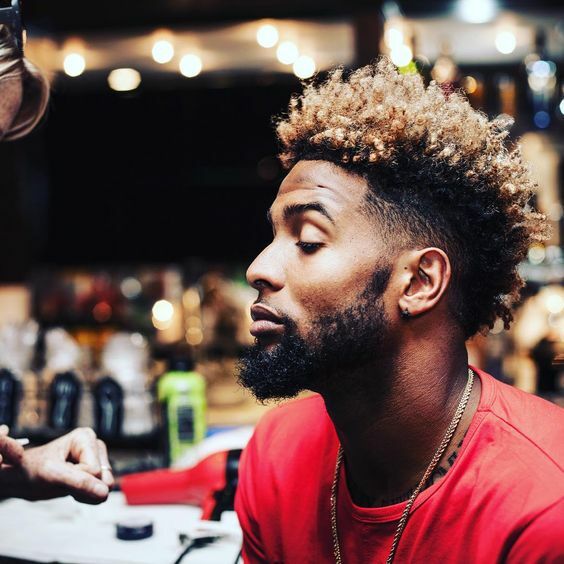 Today, Beckham continues to change up his style by alternating between short and long curls and varying shades of blonde. 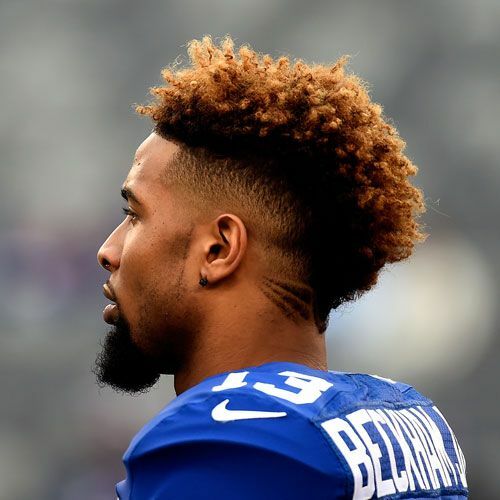 Beckham’s skills on the football field excite football fans everywhere and the same can be said about his hair. The confidence and pride he exhibits while rocking his natural tresses definitely do not go unnoticed, especially by his youngest fans. As a result, young men all over the country are being inspired to wear their natural hair longer and experiment with bolder, more colorful cuts. Older fans of Beckham’s look have embraced his bold style as well. 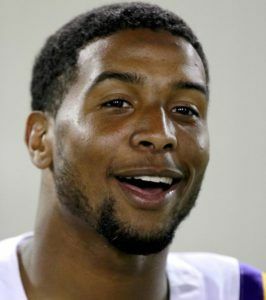 His many looks translate to many different options for guys who want to follow in his footsteps. To get Beckham’s signature style, grow your hair out to your desired length and cut it into a burst fade or frohawk style. If desired, you can lighten your hair color to a shade you’re comfortable with. If your hair is naturally dark, you’ll need to bleach it in order to go blonde. 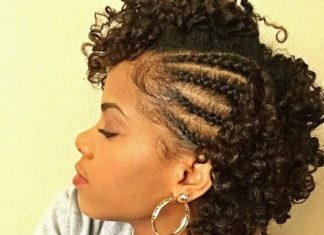 You can two strand twist your hair for extra curl definition if your hair is long enough. 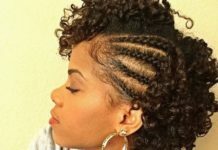 You can also use a hair sponge to twist or curl your hair. 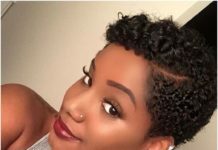 Sponges with small holes work best on short hair and sponges with large holes work best on longer hair. 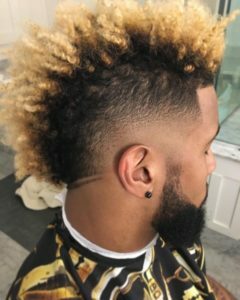 Here are some of Odell Beckham Jr.’s most memorable hairstyles, as well as some styles inspired by his famous locks. In his younger days, Beckham wore a simple, shortcut and minimal facial hair, making him almost unrecognizable compared to some of his more recent looks. This is one of Beckham’s earlier styles: a simple, short frohawk with no hair dye in sight (yet). Beckham rocked this look during his college days. 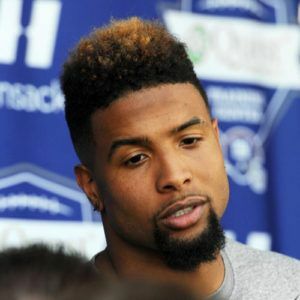 Before he went blonde, Beckham experimented with darker colors, like this light brown color on his ends. 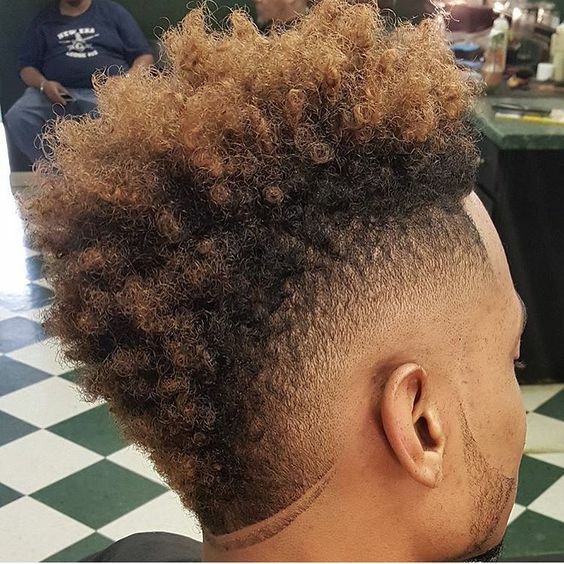 His frohawk is also a little longer here. 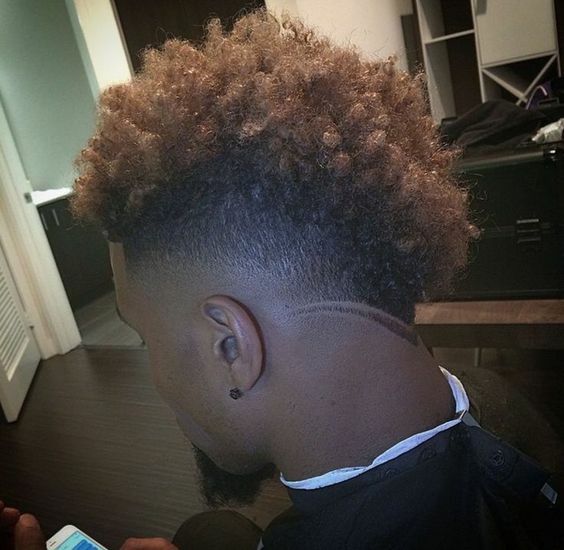 This is one of Odell Beckham Jr.’s tamer adventures with color. 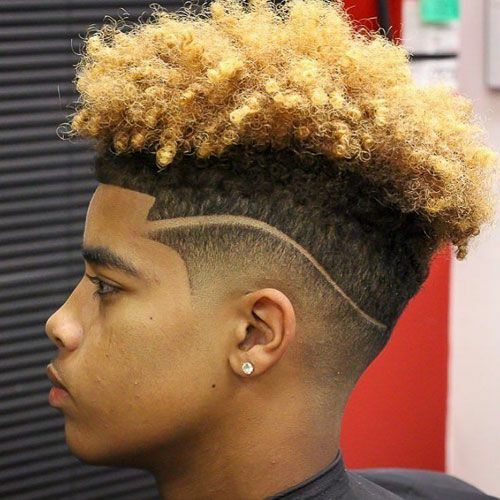 This style leans more towards high-top fade than frohawk and features a tinge of blonde color on the ends. For a short period of time, Beckham wore this unique look which consisted of dark blonde ends with a patch of red. This look is one variation of Beckham’s most popular styles. 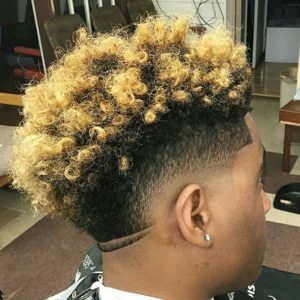 His hair is lightened to a lighter blonde color and his hair is a little longer than some of his earlier looks, styled into tight curls. Beckham grew out his hair even more for this look and his hair is as blonde as it’s ever been. 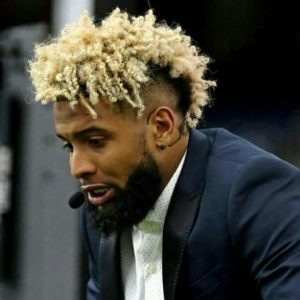 These days, Beckham opts for a longer frohawk, wearing his curls long and free, proving that his hairstyles can be worn by many, regardless of your current length. Keep scrolling for 25 more Beckham-inspired looks. 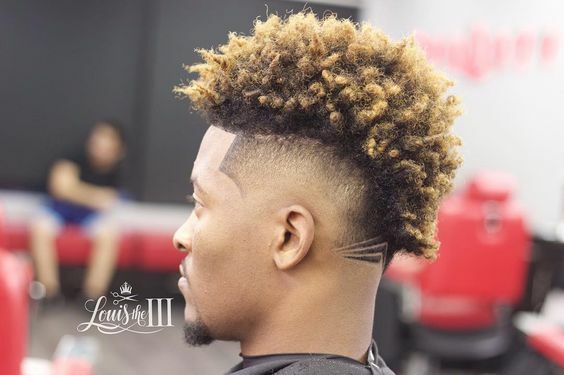 This simple frohawk is a great way to show off your natural texture. 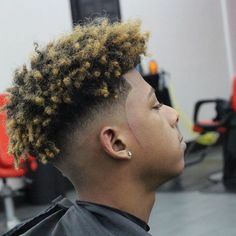 The blonde color on the ends creates a nice contrast. A sharp line-up gives this frohawk a neat, precise look. 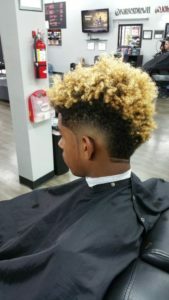 Blonde color on the ends creates a nice two-toned look. This style is reminiscent of the classic high-top fade. The hair is styled into a crop of natural curls with the ends dyed light brown for an ombre effect. 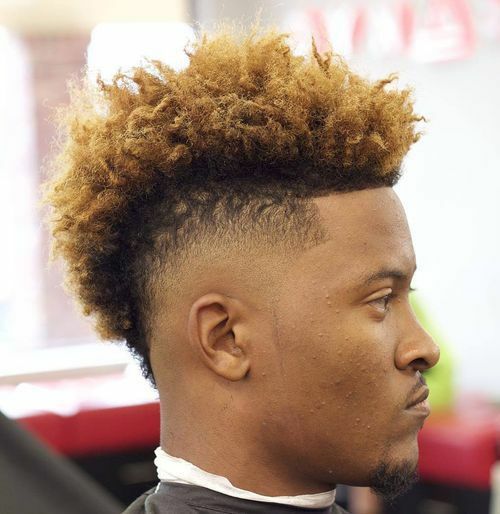 If you prefer a shorter cut, this close-cropped frohawk is a great choice. 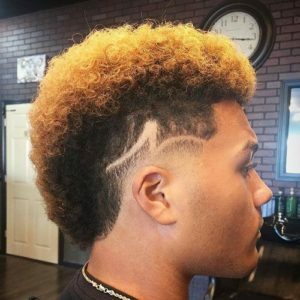 A small V shape is shaved into the back of the head to give this style a little something extra. This frohawk is tapered along the sides and the back, creating a subtle v shape at the nape of the neck. The hair is styled into a crop of soft curls. 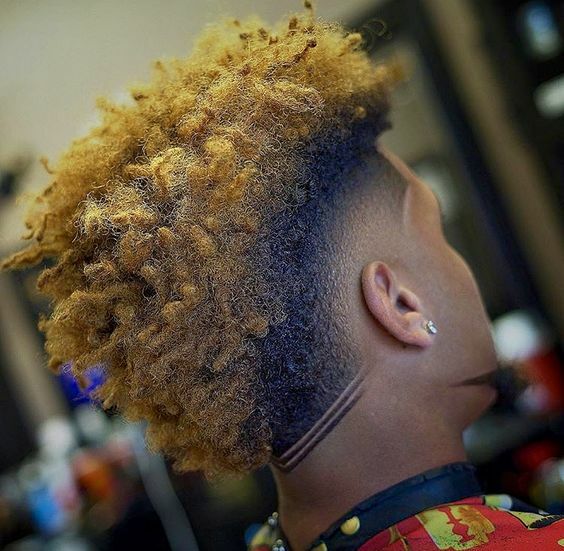 You can use a hair sponge to help create defined curls for this simple ombre-colored frohawk. If you want a style that resembles Odell Beckham’s latest look, this frohawk may be a good choice for you. 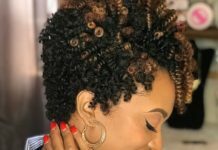 Wear your curls natural or do a twist out for more definition. 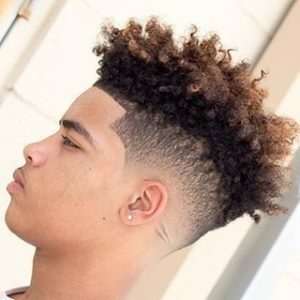 This unique frohawk style can be achieved by allowing your curls lock on their own. 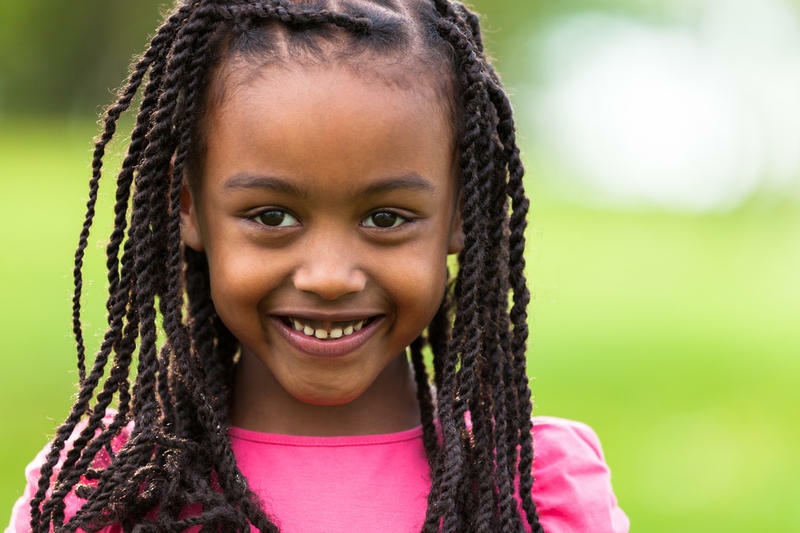 This is a great look if you’ve been contemplating growing out free-form locs. This South Of France cut is topped off by a crop of shaggy blonde curls, creating an effortless, carefree look. 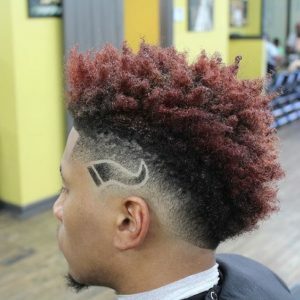 If you want a look that stands out from the rest, consider this red frohawk style with a unique design shaved along the side of the head. 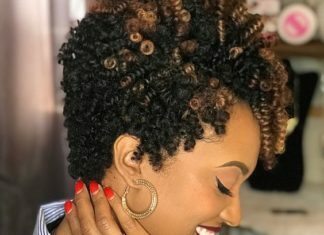 You can use a hair sponge to help get these defined coils. Shaved sides and a V-shaped design in the back emphasize the shape of this frohawk. 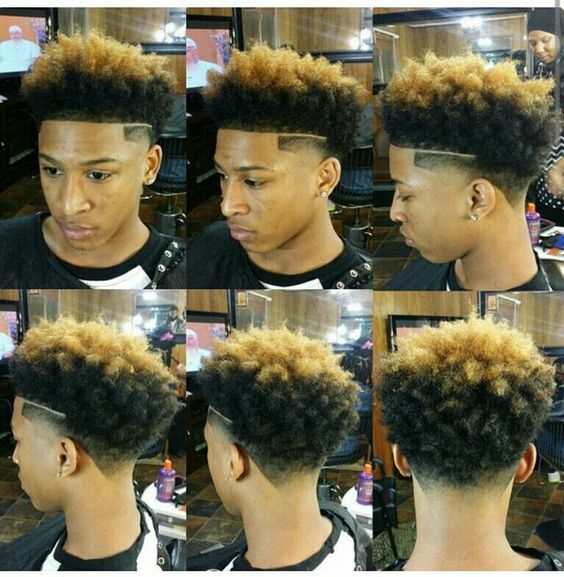 If you prefer an edgy, mushroom-shaped style, this cut may be right for you. Bleach blonde ends and a fluffy, picked out texture complete this look. 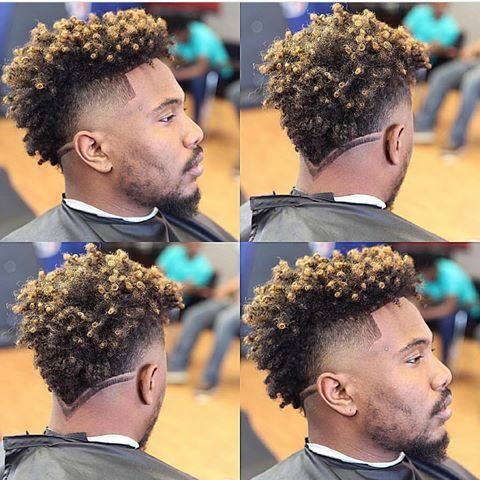 This simple burst fade/frohawk is ideal for medium-length hair. 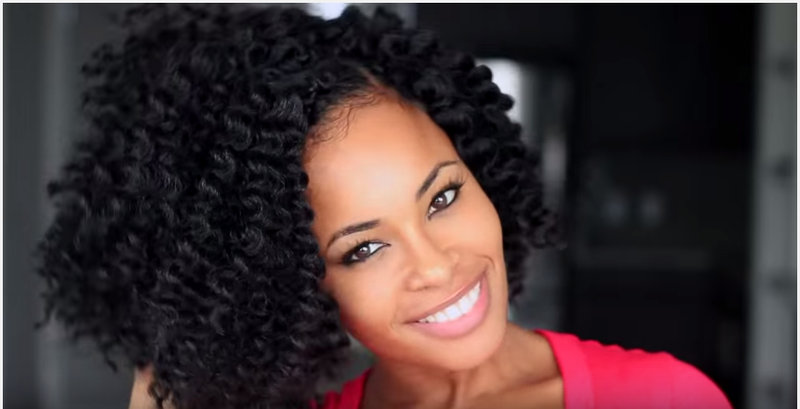 Two-strand twists are a great way to get extra curl definition and prevent tangles overnight. 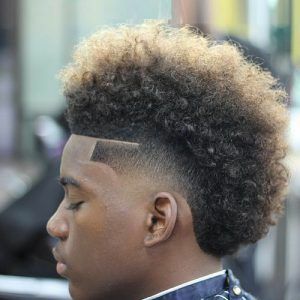 This highly textured frohawk is an effortless style that looks great on many different textures. 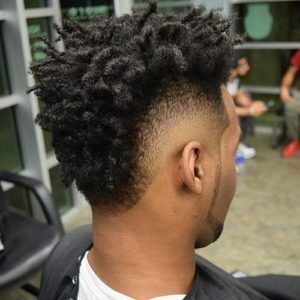 It’s also a great low-maintenance style for those who don’t prefer the look of super defined curls. 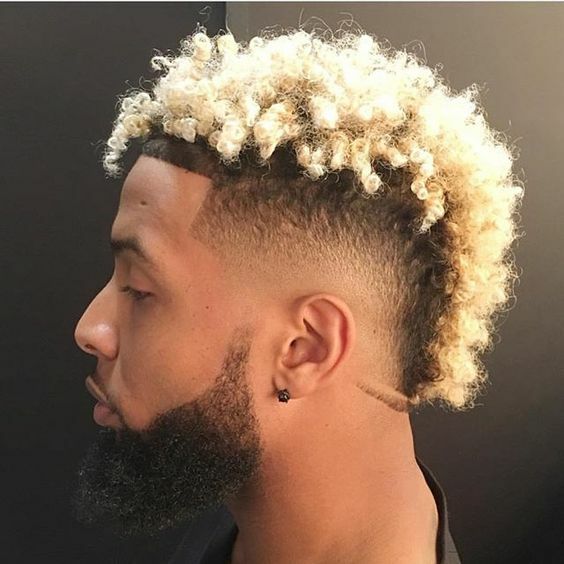 If you prefer a curly two-toned fade look to the frohawk, this is one Odell Beckham-inspired style that might be right up your alley. Here’s a unique frohawk style that can be worn as is or up in a high, curly puff. A Z-shaped design along the side gives this style an edge. This South Of France cut is embellished with a shaved design right above the ear. 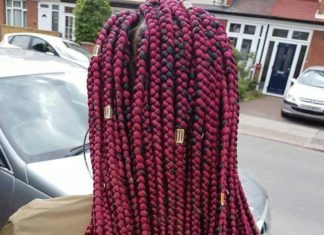 The ends of the hair are bleached and neatly coiffed. This frohawk features defined curls, a sandy brown color, and a shaved stripe behind the ear. This burst fade is topped with light blonde curls and perfectly lined up along the hairline. A small stripe is also shaved into the back of the head. 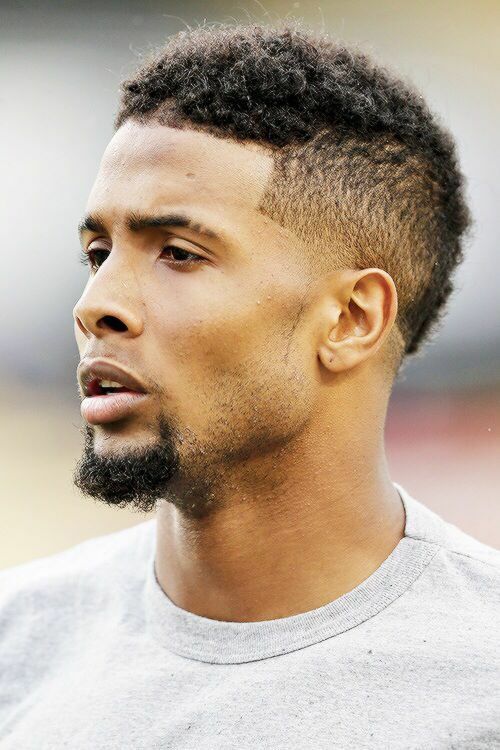 This temp fade is lined up to perfection. An asymmetrical stripe along the side and perfectly styled two-toned curls complete this look. This textured sandy brown frohawk is a great look if you want a low-maintenance style or if you’re starting free-form locs. 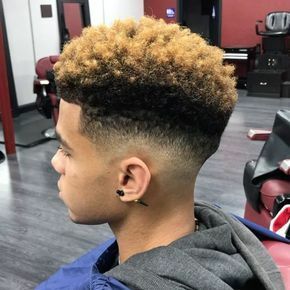 This simple fade haircut is ideal if you want a more conservative cut. 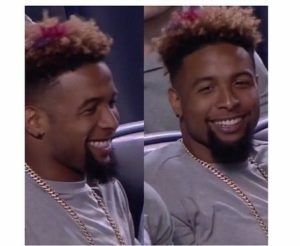 The blonde ombre color really helps your natural texture pop. This sky-high frohawk features a sharp line-up along with soft, fluffy curls and color that subtly fades out to a light brown shade. 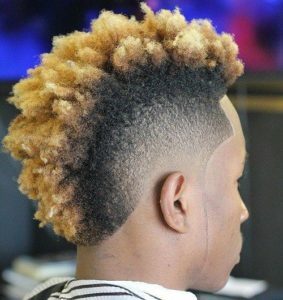 This textured frohawk is tinged with blonde color on the ends and features a shaved design at the back of the head. This style is ideal for medium-length hair. 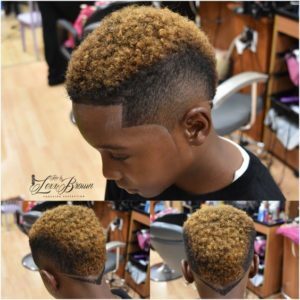 This two-toned high top features a shaved part along the side of the head and a fluffy texture on top. You can use a hair sponge with pyramid-shaped grooves to help get this look.